Suffering from lines, wrinkles acne scars, or sun damage? We’ve chosen Fractional Laser Skin Resurfacing as our go-to solution for effectively treating and improving the appearance of damaged skin for our Denver clientele. There are two types of Fractional Laser Skin Resurfacing, ablative and non-ablative, Denver Laser Solutions uses the non-ablative treatment as this is the most comfortable treatment, with the least amount of recovery time. Is Fractional Laser Skin Resurfacing for you? Fractional Laser Skin Resurfacing uses micronized heat columns to penetrate the skin in a matrix-like pattern to disrupt a portion of the skin and stimulate a healing response. The triggered response is the production of collagen to strengthen facial tissue, reduction in the appearance of static wrinkles, and correcting forms of discoloration. Mix, match and save - Realize optimal results after 3 treatments! Looking for a skincare overhaul? Purchase 3 treatments upfront & save on cost later. Combine 3 full-face treatments, plus 3 facials of your choice for a totally balanced skincare plan and take advantage of big savings. Fractional Laser Skin Resurfacing is technology developed for the esthetic industry to help correct the signs of aging. The fractionated laser pushes light and heat into the skin in a matrix-like pattern, creating narrow columns of injured skin, surrounded by healthy, untreated skin. This method stimulates your skin’s natural healing response by replacing old, sun-damaged skin with new, younger, healthier skin. Increased collagen production strengthens tissue, minimizes the appearance of static lines, and helps correct forms of discoloration. How does it compare to other skin resurfacing lasers? 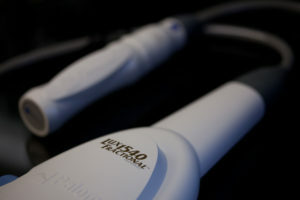 Our laser is a fractionated, non-ablative type. Non-ablative indicates that when the laser light contacts the skin the energy is delivered in the dermis while leaving the epidermis intact. Fractionated means that instead of a solid beam, our laser is split up into smaller micro beams to treat just a fraction of the skin. Both of these features mean a quicker recovery time for you. Does it fractional laser skin resurfacing hurt? Although the treatment is manageable, we usually recommend using a topical numbing cream to make the procedure more comfortable. You can purchase prescription-strength numbing cream from us to apply on your own about 45 minutes prior to your appointment time or we can apply it to you before treatment. You will experience some redness and slight swelling in the area which will start to fade several hours after treatment but may last in a mild form for 3-5 days post. A lot of our Denver clients don’t mind this swelling because it pleasantly plums up those fine lines and wrinkles! However, Ice packs are recommended intermittently several hours after treatment along with a topical healing ointment which will be applied for you. Although you will experience mild swelling and redness in the treated area, you are still able to go about your daily activities with a good application of SPF. Strenuous exercise, hot tub, saunas, Jacuzzis, and pools are to be avoided along with skin irritants such as retin-A and AHAs for 2 weeks following laser skin resurfacing. How many Fractional Laser Skin Resurfacing treatments will I need? Because this is a non-ablative fractionated device a series of 3-6 treatments are needed to ensure optimal results. Your aesthetician will help you develop a customized treatment plan based on your specific needs.